I recently had the pleasure of interviewing Scottish poets Rob A. Mackenzie and Andrew Philip for the Huffington Post UK. We conducted the interview using email, passing around batches of questions so that they we could bounce off one other's ideas and create a conversation. It was the next best thing to sharing a table at a coffee shop with them both, and the results make for an an enjoyable read: "Music, Memory and Subversion: Two Scottish Poets' Second Books". Categories: Community, Poetry, and Poetry Interviews. 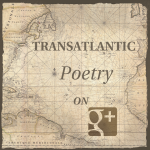 Tags: Google, The Huffington Post, and Transatlantic Poetry. Poets: Andrew Philip, George Szirtes, Jane Hirshfield, Michelle Bitting, and Rob A. Mackenzie.